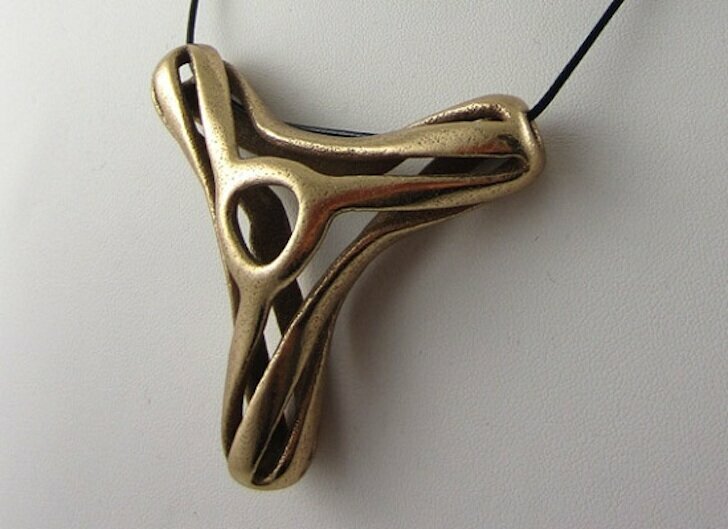 The 3D printed bronze “Love Bone” necklace at imaterialise. Just last week we told you about i.materialise announcing the ability to gold plate 3D printed stainless steel objects. Metal is on the move again at the company, as they’ve added 3D printing in both polished and unpolished bronze to their list of 3D metal printing options. Given the number of artists and jewelry makers that use i.materialise, this is going to be popular. Such beautiful pieces already come out of their 3D printers, and now there will be even more variety. And they will be pretty affordable too. They are still perfecting the pricing for it, but it’s going to be just a bit more than stainless steel pricing, which isn’t bad. Just look at the “Love Bone” necklace in the image above — you can buy it for just 41.11 Euros (about $53 US). The manufacturing process is almost identical to that of stainless steel printing, and you can watch that process in the video below.